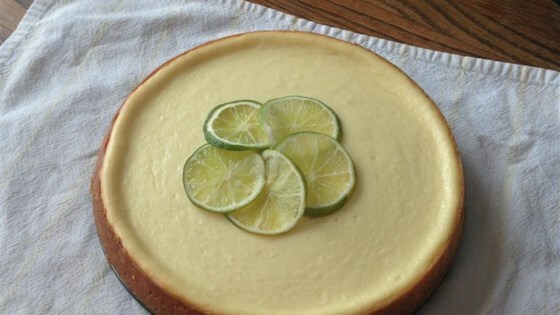 "My favorite dessert to make has to be cheesecakes. This is just one of many that gets a lot of requests. It is sweet and tangy just like its more familiar cousin, the pie. I usually serve it with whipped cream and lime slices. Enjoy!" Combine cookie or graham cracker crumbs with butter or margarine. Press into bottom and partially up sides of 9 inch springform pan. Refrigerate. In a large bowl, beat with an electric mixer the cream cheese, sugar, lime peel, and cornstarch until smooth and fluffy. Beat in eggs one at a time, blending just until smooth. Add key lime juice with mixer on low. Finish mixing by hand. Do not over beat, or cake will crack during baking. Pour batter into prepared crust. Bake at 300 degrees F (150 degrees C) for 55 to 65 minutes, or until set. To minimize cracking, place a shallow pan half full of hot water on lower rack during baking. Turn oven off, and let cheesecake stand in oven 30 minutes with the door open at least 4 inches. Remove from oven. Refrigerate cake overnight, and up to three days. GREAT RECIPE !!! BUT, I MUST ASK, WHY do people change about 5 or 6 things in a recipe & then say "This is a 5 STAR recipe" ???? I say, either make the recipe as written or don't rate it !!!! Delicious and easy. Also works well in a prepared 9" graham crust if you don't want to bother with the springform.